..... Click the link for more information. ), or infrared or ultraviolet radiation. There are three major types of optical telescopes, classified according to the element that gathers and focuses the incoming light. In the refracting telescope, or refractor, light is bent, or refracted, as it passes through an objective lens. The objective lens is convex, i.e., thicker at the middle than the edges. Parallel light passing through the lens is refracted so that it converges to a point behind the lens, called the focus. The distance from the lens to the focus is called the focal length. In a reflecting telescope, or reflector, light is reflected by a concave mirror and brought to a focus in front of the mirror. If parallel light rays are to be reflected so that they converge to a single point, the mirror must be paraboloid in shape. Typically, a glass disk is ground to this shape and then coated with a thin layer of silver or aluminum to make it highly reflecting. The third type of telescope, the catadioptric system, focuses light by a combination of lenses and mirrors. The properties of the image produced by a telescope are similar, whether formed by lenses or mirrors. The real image produced is inverted; i.e., top and bottom are reversed, as are left and right. In a terrestrial refracting telescope used to view objects on the earth, an additional lens is used to invert the image a second time, so that objects appear as they do when viewed with the unaided eye; in an astronomical telescope, image inversion is unimportant and no lens is added to invert the image a second time. The angular size of an object as seen from the position of the telescope may be expressed in degrees or in radians (1 radian equals about 57°). The angle in radians determined by the object is given by the ratio of the object's diameter to its distance from the telescope. The size of the object's image is the product of this and the focal length of the image-forming lens or mirror. For example, the angular size of the moon's diameter is about 1-2°, or roughly 1-100 radian; a telescope with a focal length of 60 in. (152 cm) would produce an image of the moon 0.6 in. (1.52 cm) in diameter. The brightness of the image depends on the total light gathered and hence is proportional to the area of the objective or the square of the diameter of the telescope. The resolution of the telescope is a measure of how sharply defined the details of the image can be. The laws of diffraction make a certain amount of blurring unavoidable, because of the wave nature of light. If two stars are very close, a given telescope may not be able to separate them into two distinct points. The smallest angular separation that can be unambiguously distinguished is called the resolving power of the telescope and is proportional to the ratio of the wavelength of light being observed to the diameter of the telescope. Thus, the larger the diameter, the smaller the minimum angular separation and the higher the resolving power. The magnification, or power, of the telescope is relevant only when an eyepiece, or ocular, is used to magnify the image for visual inspection. The angular size of the virtual image seen by the observer will be larger than the actual angular size of the object. The ratio of these two sizes is the magnifying power and is equal to the ratio of the focal lengths of the objective and ocular. Any desired magnification can be obtained with a given telescope by the use of an appropriate ocular, but beyond a point determined by the resolving power, higher magnification will reveal no further details. in optics, condition that causes a blurring and loss of clearness in the images produced by lenses or mirrors. Of the many types of aberration, the two most significant to the lens maker are spherical and chromatic. ..... Click the link for more information. . Other defects include coma, astigmatism, distortion, and curvature of field. In general, it is easier to eliminate these faults in the reflector than in the refractor. The prime focus of the reflector is inside the main tube of the telescope and thus the image cannot be observed there without blocking part of the incoming light. A variety of schemes are employed to divert the image to a more convenient location. The simplest of these, constituting the Newtonian reflector, is the placement of a flat secondary mirror in the path of the converging light just before the prime focus. The small secondary mirror, which blocks a negligible portion of the primary mirror, is tilted at an angle of 45° in order to reflect the convergent light at right angles and bring it to a focus outside the telescope tube. In the Cassegrain system, the secondary mirror is convex and reflects the convergent light directly back along the axis of the telescope through a hole in the center of the primary mirror. By causing light to traverse a longer path, the effective focal length is increased and a larger image is formed. The Gregorian system is similar to the Cassegrain, except that the secondary mirror is concave. The Coudé system uses both a convex secondary mirror and one or more diagonal flat mirrors to produce a focus outside the tube. The secondaries are arranged so that the position of the focus remains stationary as the telescope rotates, allowing the use of image-recording and analyzing devices that would be too heavy to mount directly on a moving telescope. The Schmidt camera telescope, invented in 1930 by Bernard Schmidt, is a catadioptric system used for wide-angle photography of star fields. The primary mirror is spherical instead of paraboloidal, which requires that a special correcting lens be used on the front of the tube. The Maksutov telescope, invented by D. D. Maksutov in 1941, is similar in design and purpose to the Schmidt telescope but has a spherical meniscus in place of the correcting plate of the Schmidt. Equal in importance to the mirrors and lenses constituting the optics of a telescope is the mounting of the telescope. The mounting must be massive, in order to minimize mechanical vibration that would blur the image, especially at high magnification or during long-exposure photography. At the same time, motion of the telescope must be precise and smooth. To allow the telescope to be pointed in any direction in the sky, the mounting must provide rotation about two perpendicular axes. In the altazimuth mounting, one axis points to the zenith and allows rotation along the horizon and the other allows changes in altitude, or distance above the horizon. This mounting is used for small terrestrial telescopes and, since the 1970s, most new astronomical telescopes use altazimuth mountings that are computer-driven in both axes. Before the 1970s, most astronomical telescopes used the equatorial mounting, in which one axis points at the celestial pole and hence is parallel to the earth's axis. The first practical telescopes were refracting telescopes produced at the beginning of the 17th cent. By 1610, Galileo had made extensive astronomical use of the simple refractor. The best telescopes of this period had very long focal lengths to minimize the chromatic aberration inherent in the single-element objective. The multielement objective, invented in 1733, allowed the construction of telescopes of large aperture. The art of building refracting telescopes reached a high point in the 19th cent. The largest refractor in existence, with an objective lens 40 in. (102 cm) in diameter, is located at the Yerkes Observatory in Williams Bay, Wis. A 36-in. (91-cm) refractor is located at the Lick Observatory in California and a 33-in. (84-cm) refractor is located at Meudon, France. These telescopes represent the practical limit on the size of a refractor. Because a lens can be supported only at its edge, the weight of the lens itself produces unavoidable distortion in the shape. Because a mirror can be supported from behind, it can be much more massive without incurring distortion, and mirrors many feet in diameter have been constructed. The first reflecting telescope, built by Isaac Newton in 1672, had a mirror made of a metal alloy. When techniques for depositing metal films on glass surfaces were developed, reflecting telescopes became comparable in precision to refractors. An important advantage of the reflecting telescope is the absence of chromatic aberration. Because only one surface must be ground to an exact shape, the reflector is also easier to manufacture. Although increasingly larger mirrors provide increasingly greater light-gathering ability, the cost increases even more rapidly. Several innovations were introduced toward the end of the 20th cent. to achieve the goal of increasing light gathering more economically. , astronomical observatory complex located on Mauna Kea peak, the "white mountain" on the island of Hawaii, at an altitude of more than 13,600 ft (4,145 m). ..... Click the link for more information. , Hawaii. Each has a segmented primary mirror, composed of 36 separate hexagonal pieces. Each segment is about 72 in. (1.8 m) across but only 3 in. (76 mm) thick, creating a 394-in. (10-m) diameter primary mirror. The position of each 880-lb (400-kg) segment is computer controlled to a tolerance of less than one millionth of an inch. The 430-in. (11-m) primary mirror array of the Hobby-Eberly telescope at the McDonald Observatory, Tex., is made of 91 250-lb (113-kg) hexagonal segments. The revolutionary design, which resulted in an effective aperture, after upgrades, of 394 in. (10 m), enabled it to be constructed at 20% the cost of similar telescopes. The largest segmented mirror telescope is the Great Canary Telescope at the Roque de los Muchachos Observatory on the island of Palma in the Canary Islands. Active optics and its 36 hexagonal mirrors create a 410-in (10.4-m) primary mirror. (ESO), an intergovernmental organization for astronomical research with headquarters in Garching, near Munich, Germany. The ESO began in 1962 as a consortium among Belgium, France, Germany, the Netherlands, and Sweden. astronomical observatory located 35 mi (56 km) S of Tucson, Ariz., at an altitude of 8,500 ft (2,590 m). It is operated jointly by the Smithsonian Astrophysical Observatory and the Univ. of Arizona. astronomical observatory located in California on Mt. Wilson, near Pasadena. Mt. Wilson Observatory was founded in 1904 by George E. Hale. Its equipment includes 100-in. (2.5-m) and 60-in. (1. ..... Click the link for more information. , Calif. The MMT, which became operational in 1979, consisted of six 72-in. (1.8-m) telescopes on a common mounting and having a resolving capability equal to that of a 176-in. (4.5-m) reflector of conventional design. It was replaced by a conventional 256-in. (6.5-m) single-mirror telescope in 1999. The COAST system, which became operational in 1996, combines light from a trio of small telescopes spaced about 20 ft (6 m) apart. The twin Keck telescopes, in domes a few hundred feet apart, have adaptive optics that make them equivalent in resolving power to a telescope with a mirror 280 ft (85 m) across. The CHARA Array, fully operational in 2002, consists of six 39-in. (1-m) aperture telescopes arranged in a Y-shape and contained in a 1,300-ft (400-m) diameter circle; the combined signals from the six telescopes provide the equivalent of the resolving capability of a telescope 1,080 ft (330 m) wide. , peak, 6,126 ft (1,867 m) high, S Calif., NE of San Diego, in Cleveland National Forest. It is the site of the Palomar Observatory, operated by the California Institute of Technology. , astronomical observatory located on Cerro Tololo peak, Chile, with offices in La Serena, about 40 mi (64 km) to the west. Funded by the U.S.
astronomical observatory located southwest of Tucson, Ariz.; it was founded in 1958 under contract with the National Science Foundation and is administered by the Association of Universities for Research in Astronomy. astronomical observatory located on Mt. Hamilton, Calif., near San Jose; the first mountaintop observatory in the world, it was founded through gifts made by James Lick in 1874–75 and came under the direction of the Univ. astronomical observatory located on Mt. Locke, near Fort Davis, Tex. ; founded in 1932, sponsored by the Univ. of Texas in cooperation with the Univ. of Chicago. Its equipment includes 107-in. (272-cm), 82-in. (208-cm), 32-in. (81-cm), and 30-in. astronomical observatory located on Siding Spring Mountain, near Coonabarabran, at an altitude of nearly 4,000 ft (1,220 m) in the Warrumbungle Mts. of New South Wales, Australia. It began as a field station for Mt. ..... Click the link for more information. is a 94.5-in. (2.4-m) reflector. See H. G. J. Rutten and M. A. M. Van Venrooij, Telescope Optics: Evaluation and Design (1988); R. N. Wilson, Reflecting Telescope Optics: Basic Design Theory and Its Historical Development (1996); R. Moore, Eyes on the Universe: The Story of the Telescope (1997); S. F. Tonkin et al., Amateur Telescope Making (1998); J. B. Zirker, An Acre of Glass: A History and Forecast of the Telescope (2005). For many applications, the Earth's atmosphere limits the effectiveness of larger telescopes. The most obvious deleterious effect is image scintillation and motion, collectively known as poor seeing. Atmospheric turbulence produces an extremely rapid motion of the image resulting in a smearing. On the very best nights at ideal observing sites, the image of a star will be spread out over a 0.25-arcsecond seeing disk; on an average night, the seeing disk may be between 0.5 and 2.0 arcseconds. The upper atmosphere glows faintly because of the constant influx of charged particles from the Sun. The combination of the finite size of the seeing disk of stars and the presence of airglow limits the telescope's ability to see faint objects. One solution is placing a large telescope in orbit above the atmosphere. In practice, the effects of air and light pollution outweigh those of airglow at most observatories in the United States. There are basically three types of optical systems in use in astronomical telescopes: refracting systems whose main optical elements are lenses which focus light by refraction; reflecting systems, whose main imaging elements are mirrors which focus light by reflection; and catadioptric systems, whose main elements are a combination of a lens and a mirror. The most notable example of the last type is the Schmidt camera. Astronomers seldom use large telescopes for visual observations. Instead, they record their data for future study. Modern developments in photoelectric imaging devices are supplanting photographic techniques for many applications. The great advantages of detectors such as charge-coupled devices is their high sensitivity, and the images can be read out in a computer-compatible format for immediate analysis. Light received from most astronomical objects is made up of radiation of all wavelengths. The spectral characteristics of this radiation may be extracted by special instruments called spectrographs. The 5-m (200-in.) Hale telescope at Palomar Mountain, California, was completed in 1950. The primary mirror is 5 m in diameter with a 1.02-m (40-in.) hole in the center. The 4-m (158-in.) Mayall reflector at the Kitt Peak National Observatory was dedicated in 1973. The prime focus has a field of view six times greater than that of the Hale reflector. An identical telescope was subsequently installed at Cerro Tololo Inter-American Observatory, in Chile. The mirrors for these traditional large telescopes were all produced using the same general methodology. A large, thick glass mirror blank was first cast; then the top surface of the mirror was laboriously ground and polished to the requisite shape. The practical and economical limit to the size of traditional mirror designs was nearly reached by the 6-m (236-in.) telescope in the Caucasus Mountains, Russia. Newer telescopes have been designed and built that use either a number of mirrors mounted such that the light collection by them is brought to a common focus, or lightweight mirrors in computer-controlled mounts. The Keck Telescope on Mauna Kea, Hawaii, completed in 1993, is the largest of the segmented mirror telescopes to be put into operation. The telescope itself is a fairly traditional design. However, its primary mirror is made up of 36 individual hexagonal segments mosaiced together to form a single 10-m (386-in.) mirror. Electronic sensors built into the edges of the segments monitor the relative positions of the segments, and feed the results to a computer-controlled actuator system. In 1989, the European Southern Observatory put into operation their New Technology Telescope. The 3.58-m (141-in.) mirror was produced by a technique known as spin-casting, where molten glass is poured into a rotating mold. Worldwide efforts are under way on a new generation of large, ground-based telescopes, using both the spin-casting method and the segmented method to produce large mirrors. 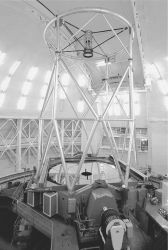 The Gemini project of the National Optical Astronomy Observatories included twin 8.1-m (319-in.) telescopes, Gemini North (see illustration) on Mauna Kea, Hawaii, and Gemini South on Cerro Pachon in Chile. The Very Large Telescope (VLT), operated by the European Southern Observatory on Cerro Paranel, Chile, consists of four 8-m (315-in.) “unit” telescopes with spin-cast mirrors. The light from the four telescopes is combined to give the equivalent light-gathering power of a 16-m (630-in.) telescope. The last of the four telescopes began collecting scientific data in September 2000. Soon after the telescope was launched in 1990, it was discovered that the optical system was plagued with spherical aberration, which severely limited its spatial resolution. After space-shuttle astronauts serviced and repaired the telescope in 1993, adding what amounted to eyeglasses for the scientific instruments, the telescope exceeded its prelaunch specifications for spatial resolution. Subsequent servicing missions replaced instruments with newer technology. 1. An optical device for collecting light so as to form an image of a distant object. The light is collected and focused by an object lens in a refracting telescope or by a primary mirror in a reflecting telescope. A telescope is usually described in terms of its aperture: light-gathering power, spatial resolution, and limiting magnitude all increase as the aperture increases. 2. Any device by which radiation from a particular spectral region can be collected and focused on or brought to a suitable recording system for analysis. See coded-mask telescope; grazing incidence; infrared telescope; radio telescope. What does it mean when you dream about a telescope? Dreaming about a telescope can represent the need to take a closer look at something. Alternatively, it could represent exaggerating something, making it bigger than it actually is. Any device that collects radiation, which may be in the form of electromagnetic or particle radiation, from a limited direction in space. An assemblage of lenses or mirrors, or both, that enhances the ability of the eye either to see objects with greater resolution or to see fainter objects. The German Design Council named this telescopic handler as the winner of the renowned "German Design Award 2018" in the transportation category for its ideal visibility and its dynamic appearance. We aimed to observe the clinical and radiological efficacy of the telescopic corkscrew tipped nail, developed in our country and started to be used in practice in long bone fractures due to osteogenesis and deformities. This is the largest telescopic gangway we've created and the biggest order we have secured for the business. The telescopic element sits in a ring around this central region. Talbert Manufacturing offers the new multi-purpose 55-ton Telescopic Trailer and Talbert SSTA (Traveling Axle) 5053 Trailer. NORDIC BUSINESS REPORT-August 22, 2011--Norwegian Comrod to acquire 80% in Swedish Wibe Telescopic Mast(C)2011 M2 COMMUNICATIONS http://www. M2 EQUITYBITES-August 22, 2011--Norwegian Comrod to acquire 80% in Swedish Wibe Telescopic Mast(C)2011 M2 COMMUNICATIONS http://www. India, March 16 -- Manitou has introduced the MLT 625, a telescopic handler. Haulotte recently added a new telescopic jib to its product range. Haulotte Middle East FZE is using the five-day event to launch their new telescopic big boom, an aerial working platform with a six metre telescopic jib, an outreach of 23 metres and the capacity to lift rapidly up to 350 kilograms.